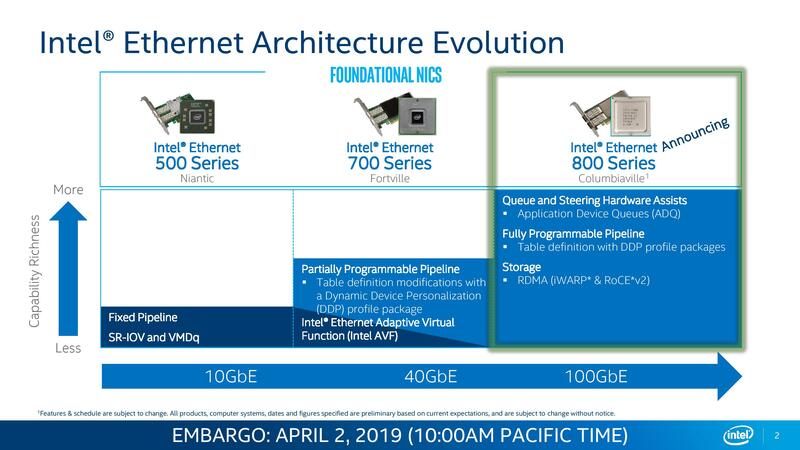 Among the many data center announcements today from Intel, one that might fly under the radar is that the company is launching a new family of controllers for 100 gigabit Ethernet connectivity. Aside from the speed, Intel is also implementing new features to improve connectivity, routing, uptime, storage protocols, and an element of programmability to address customer needs. Adding queues to networking traffic isn’t new – we’ve seen it in the consumer space for years, with hardware-based solutions from Rivet Networks or software solutions from a range of hardware and software companies. Queuing network traffic allows high-priority requests to be sent over the network preferentially to others (in the consumer use case, streaming a video is a higher priority over a background download), and different implementations either leave it for manual arrangement, or offer whitelist applications, or do traffic analysis to queue appropriate networking patterns. 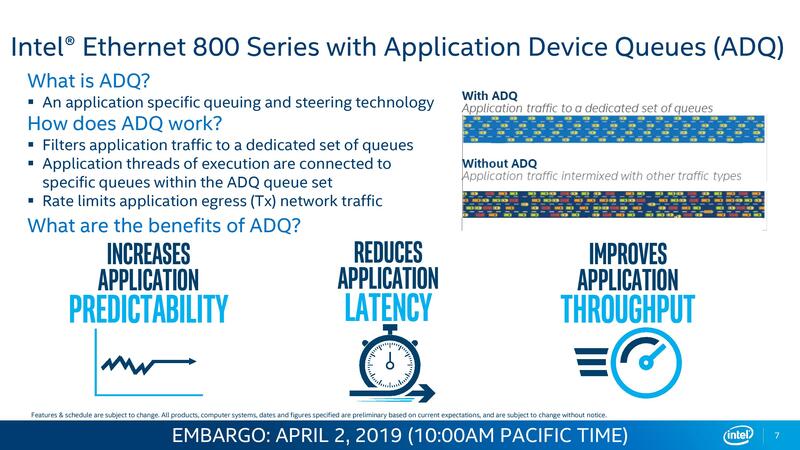 With Intel’s implementation of ADQ, it instead relies on the application deployment to know the networking infrastructure and direct accordingly. The example given by Intel is a distributed Redis database – the database should be in control of its own networking flow, so it can tell the Ethernet controller how to manage which packets and how to route them. The application knows which packets are higher priority, so it can send them on the fastest way around the network and ahead of other packets, while it can send non-priority packets on different routes to ease congestion. Unfortunately, it was hard to see how much of a different ADQ did in the examples that Intel provided – they compared a modern Cascade Lake system (equipped with the new E810-CQDA2 dual port 100G Ethernet card and 1TB of Optane DC Persistent Memory) to an old Ivy Bridge system with a dual-port 10G Ethernet card and 128 GB of DRAM (no Optane). While this might be indicative of a generational upgrade to the system, it’s a sizeable upgrade that hides the benefit of the new technology by not providing an apples-to-apples comparison. DDP was introduced with Intel’s 40 GbE controllers however it gets an updated model for the new 800 series controllers. DDP in simple terms allows for a programmable protocol within the networking infrastructure, which can be used for faster routing and additional security. With DDP, the controller can work with the software to craft a user-defined protocol and header within a network packet to provide additional functionality. As mentioned, the two key areas here are security (cryptography) or speed (bandwidth/latency). 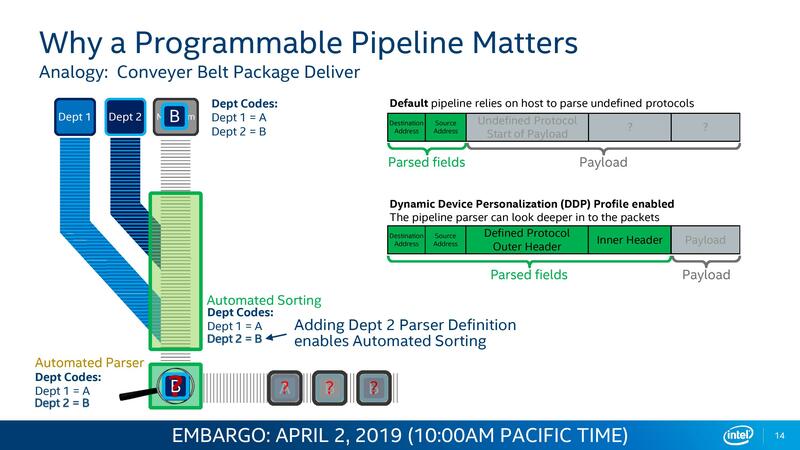 With the pipeline parser embedded in the controller, it can both craft an outgoing data packet or analyse one coming in. When the packet comes in, if it knows the defined protocol, it can act on it – either sending the payload to an accelerator for additional processing, or pushing it to the next hop on the network without needing to refer to its routing tables. With the packet being custom defined (within an overall specification), the limits to the technology depend on how far the imagination goes. Intel already offers DDP profiles for its 700-series products for a variety of markets, and that is built upon for the 800-series. For the 800 series, these custom DDP profiles can be loaded pre-boot, in the OS, or during run-time. But OmniPath is 100G, right? For users involved in the networking space, I know what you are going to say: doesn’t Intel already offer OmniPath at 100G? Why would they release an Ethernet based product to cannibalize their own OmniPath portfolio? Your questions are valid, and depending on who you talk to, OmniPath has either had a great response, a mild response, or no response to their networking deployments. Intel’s latest version of OmniPath is actually set to be capable of 200G, and so at this point it is a generation ahead of Intel’s Ethernet offerings. It would appear that based on the technologies, Intel is likely to continue this generational separation, giving a choice for customers to either take the latest it has to offer on OmniPath, or take its slower Ethernet version. When asked, Intel stated that it is not disclosing the process node the new controllers are built on, nor the power consumption. Intel stated that its 800 series controllers and corresponding PCIe cards should launching in Q3.